Thanksgiving is a festive holiday. Besides the food, it's an appropriate event to remember thankfulness. Working on crafts together is a great time to spark a discussion about being thankful. These easy centerpieces will liven up any Thanksgiving table and allow your kids to help participate in the celebration. Most of these crafts use household items you probably have on hand. For a large table, make a few of the centerpieces and spread them around the table. Even if you aren't hosting the meal, check with your hosts and see if your child can bring some decorations for their Thanksgiving. This thoughtful gesture shows the meaning of the holiday. How easy is this beautiful Thanksgiving centerpiece? Your kids will love pouring the corn into the vase. Put a candle in the middle and place it on your table for your Thanksgiving dinner. If you have a large table, consider making a few of these centerpieces. You can use different sized glasses or candles to add some variety to the table. After the party, you can even use the corn to make popcorn for a late night treat. Bring some silly personality to the Thanksgiving table with these goofy and cute gourd turkeys. They make such a great craft and centerpiece for Thanksgiving. Add colorful feathers and googly eyes to make each one have its own distinct look. If you have a lot of small gourds, consider making one for each place setting and giving your guests their own personality filled turkey gourd. Chocolate covered pretzels are a simple and yummy Thanksgiving centerpiece that you and your family can make together. Cover pretzels in chocolate and use them as the feathers for this turkey centerpiece. The best part is they can be eaten for dessert! Craft these Thanksgiving turkeys bags and use them as centerpieces, favor bags, or just something to keep the kids busy while you're making dinner. If you plan to have assigned seats at your Thanksgiving table, make one for each guest and write their name on the bag, which can double as a place card. Colorful, trendy, and totally awesome, this DIY confetti-stuffed turkey centerpiece has it all! Plus its tons of fun to make with your kids. If you are feeling super crafty, make extra turkey legs to decorate the table. Use pretty fall colored paper to craft these paper pumpkin ​centerpieces. This is a super easy craft that your kids can do for Thanksgiving. If you have enough time and paper, make one for each place setting. Looking for a quick and last minute centerpiece idea? You probably already have all of these supplies in your home. Get everything together and create this THANKS centerpiece craft with your kids! 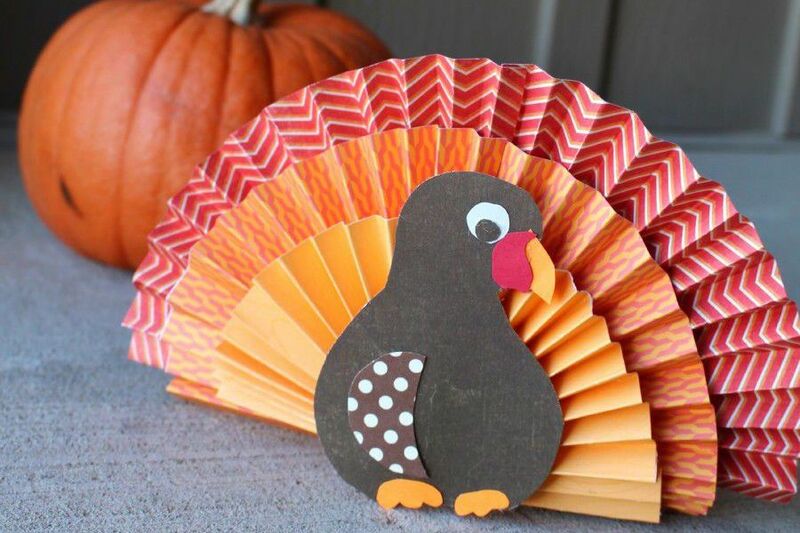 This paper fan turkey is beautiful, cute, and easy. Your little ones are going to love making these. They perfect for your Thanksgiving table and if you have extra time and paper, make a few turkeys as added decorations.